Oh Chrismukkah Tree, Oh Chrismukkah Tree! I'm delighted to have Samira K. Mehta here as a new regular blogger; she's an old friend of the blog, but finally agreed to sign on to post on the 7th of each month. Welcome! Every year, on the plane from AAR to Thanksgiving, I flip through Skymall and I see an advertisement for the “Star of David Christmas Tree Topper,” with the following caption. “Celebrate the warmth and wonder of both Hanukkah and Christmas. Here's the perfect way for interfaith families to celebrate both holidays.” This year, I was not on a plane, but I gather, from the many colleagues I asked to track down the image, neither was the ornament. Perhaps it was missing because this summer Buzzfeed referred to the item as “one of the 30 most insane things for sale in the Skymall Magazine.” Maybe the Talking Smurf Toothbrushes edged it out. Perhaps someone in the Skymall marketing division realized that Thanksgivukkah (covered so well on this blog by Jodi Eichler-Levine) meant that this was not really the year for Chrismukkah ornaments. Regardless of why it was not in the magazine, the Star of David tree topper remains on the Skymall website, and it may not be quite as ridiculous as Buzzfeed would like to think. The Skymall tree topper is part of a large cadre of trappings in the holiday arsenal of Christian–Jewish interfaith families. For all Chrismukkah will not happen this year, as a result of the calendric twist of fate that brought us Thanksgivukkah, the blended holiday has long been a symbol for the discomfort many feel with interfaith marriage. The idealized happy holiday season has long been seen as particularly fraught for couples coming to their marriages from different traditions. As the intermarriage rate rose through the 1970s and 80s, before coming to rest in the neighborhood of 50%, the question of the “December Dilemma” got featured in newspapers from the Cincinnati Enquirer to the New York Times. In short, the December dilemma is the question of what the interfaith family is to do about the seasonal festivities that are American Christmas and American Hanukkah. What, then, is the status of “Chrismukkah” in this world, and what does it mean more broadly for interfaith families and American religious culture? 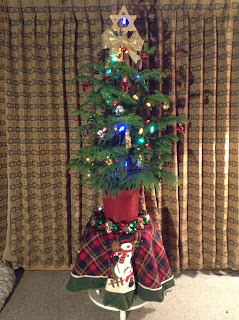 Often, for couples who primarily affiliate with Jewish communities, the presence, or absence, of a Christmas tree served as a litmus test for whether an interfaith family was "Jewish enough." Particularly in communities where Jewish observance was low, the interfaith couple was not asked to maintain a Jewish home by keeping kosher or lighting Shabbat candles. Instead, being Jewish was marked by the absence of Christian practice. When an interfaith couple promised to keep a Jewish home as a condition of having a Jewish wedding, the rabbi required that they promise not to observe Christmas at home. The concern was not so much that the celebration of Christmas would make the children of an interfaith marriage accept Jesus Christ as their Lord and Savior. Rather, growing up with a tree in the home could make the children feel Christian—or at least like Christmas-celebrating American cultural Christians. Additionally, many commentators (and Jewish family members) pointed out that Christmas can be a time of cultural alienation for American Jews—a time when the entire culture, with the Santas at the mall and the carols piped into the grocery stores, remind Jews that they were not “real” Americans. 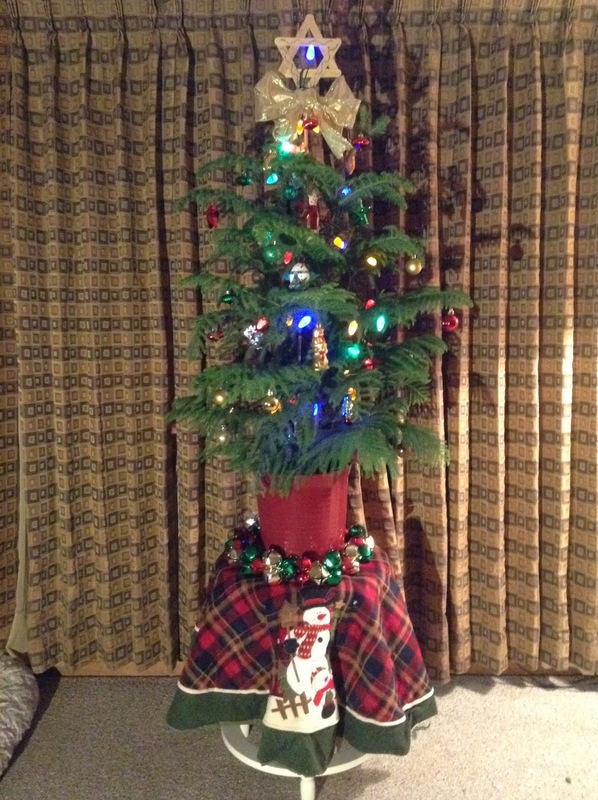 Asking a Jewish spouse to have the trappings of Christmas in his or her home was therefore one step too many. While religious leaders were often concerned about the religious purity of children of interfaith families, not all families shared those concerns. The bulk of my research addresses the practices of these families, and ways they use ideas of religion and culture to explain their choices at all times of the year. In the spirit of the season, however, I will leave you with three examples of how interfaith families have chosen to navigate the interfaith holiday. their three-year-old, who just this year became a bar mitzvah. These families frame their decisions to include both holidays in a number of ways. Sometimes, the message conveyed is that the celebration is important to non-Jewish family members. One Jewish mother, whose husband has Catholic children from a previous marriage, asked how her family would have benefited if her now adult stepchildren could not share Christmas with their father. She pointed out that if sharing Christmas helped her stepchildren to connect with their much younger half-siblings, then Christmas was good for the family. Another Jewish mother referred to her Baptist mother-in-law, saying, “If you love Grandma, you need to at least know what Grandma loves.” A Jewish husband pointed out that his wife had agreed to raise Jewish children, and while they had initially agreed not to have Christmas in their home, she got depressed every December. And so, they decided that Christmas was important. It is important to note that the celebration of Christmas did not always please the Jewish spouse and parent. 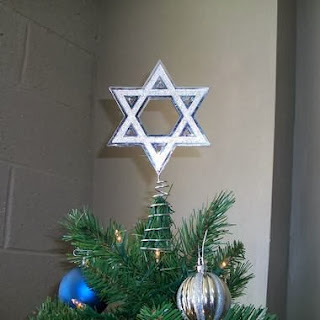 The same woman who preserved her son’s Christmas tree topper for a decade found herself, this year, “feeling sad that Hanukkah is over and now it is all Christmas all the time. [I] just need to keep reminding myself: trees are pretty, trees make people happy, trees are not meant to exclude.” She, and some of the others raising Jewish children with the support of Christian spouses and co-parents, pointed out that marriage is compromise and felt that the compromise of the tree was small when compared to religious education and community. Another group of families celebrate both holidays and are part of a small but growing trend of intentionally dual-religion homes. Susan Katz Miller blogs about her experiences in such a family on her blog On Being Both and recently published a book that I will be writing more about here in the future. In her family, and in the families in their community, the intention is to raise children who are educated and conversant in the narratives and practices of both Christianity and Judaism. As a result, they celebrate both Hanukkah and Christmas, Easter and Passover. Individual families make different choices about Christmas consumption and volunteering, but they make a point of including the stories of both traditions in their celebrations. 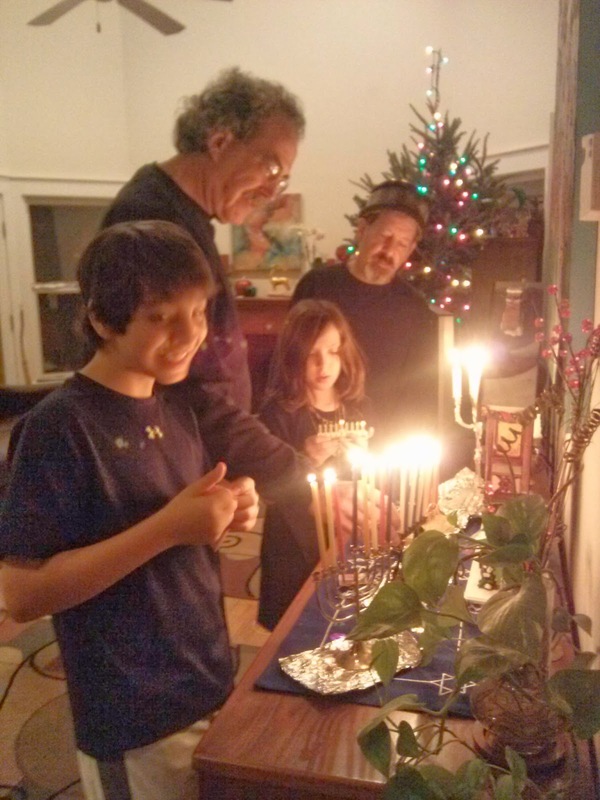 Katz Miller’s children know the story of Hanukkah, and its relatively minor status in the panoply of Jewish holidays. They know the blessings over the Hanukkah candles and enjoy good sufiganyot, just as the exclusively Jewish kids do. Whereas many of the families who have chosen to affiliate exclusively Jewishly intentionally keep Christ out of Christmas, Katz Miller’s children know the story from the Gospel of Luke. They talk about Jesus as someone that some in their community consider a savior. For Katz Miller and her family, celebrating Christmas is part of a larger effort to practice both Judaism and Christianity “religiously,” outside of the now secularized and commercialized holiday season. What both of these families have in common is that, for all the cultural fuss about the blended (and invented) “holiday” of Chrismukkah, these families are careful to keep their holidays separate. They might, in some years, intersect. They might light a menorah in the shadow of a Christmas tree. That intersection, however, is incidental. The holidays are not blended into a third set of practices. The third category is, of course, the Chrismukkah crowd. These are the folks who celebrate both holidays in what Ron Gompertz, one of the primary promoters of Chrismukkah, calls “a merry mishmash” of the winter holiday season. Chrismukkah is largely the territory of those who might identify as “religious nones,” (as the 2012 study from the Pew Center of Religious Life has put it) and is done with a tongue-in-cheek irony absent from most of the families that I studied. What Chrismukkah hype does provide is insight into a particular understanding of religion in America. 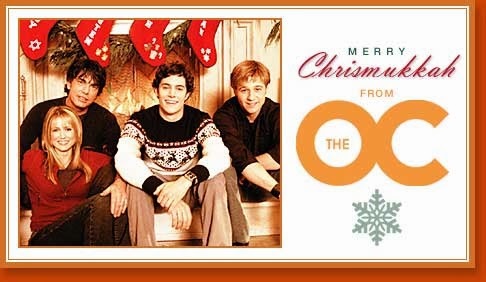 Indeed, the fact that such a holiday—popularized by a popular teen soap opera of the early 2000s, The OC—has spawned its own cards, rituals, and, yes, Christmas tree toppers, is indicative of the ways in which American culture has absorbed, blended, and reformulated two religious holidays as part of the American story. Is “Chrismukkah” Jewish? Is it Christian? The answer hardly seems to matter. Rather, it has become a stand-in for how to participate in—as opposed to negotiate around—the “December dilemma.” The very existence of a “Chrismukkah” option demonstrates a kind of fluidity of American religious practice. The question of whether one can have it all—Christmas, Hanukkah, Christianity, Judaism—and not wind up having nothing at all is never addressed in the Chrismukkah narrative. And as far as the holiday itself is concerned, why would it need to? After all, in the words of Seth Cohen, the child of the interfaith marriage on the OC, “I’ve got Jesus and Moses on my side.